I’m sure we’ve all seen this commercial, you turn the water on and this hose grows, stretching to where you need it, you turn the water off, and it shrinks back, neatly putting itself away. It does not actually work like that. I was given this hose for free to try out, and now I get to let you know how it went. So, the outer canvas wrap is mostly for looks, it doesn’t seem to serve a purpose (but it does, read on), instead there is some sort of very stretchy rubber hose on the inside. It does stretch, but more in girth than in length. As it fills with water pressure builds up inside and the rubber inner house expands, as you spray water out of the house pressure is relieved and it shrinks. The canvas wrap is there as a backstop, to prevent it from expanding too much, and bursting like a balloon. Picture a balloon inside of a pillow case. So you turn it on, it expands slightly (I would say no more than 20% in length), and use it to water. Then you turn the water off, and it shrinks…. nope! It doesn’t, you can turn the water off but so long as pressure is still inside the hose it will not shrink. After you turn the water off you need to run the hose for some time, I would guestimate 30 seconds, in order for it to shrink back down in size. The house does not take standard fittings, it came with it’s own fittings, and they seem nice and are quality enough, but in the end, the “expandability” is a gimmick. 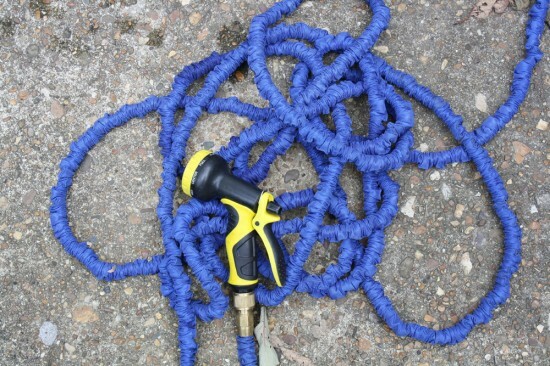 This hose certainly functions as well as any other hose, but I don’t see much use in the expandability, at least in the garden, because something that stretches in girth is not helping us keep our hoses neat and tidy. Where I can see a use is if you need to pack the hose away, or travel somewhere with it. That a very long hose can fit into a little box is certainly useful, and overall it is lighter as well. You could certainly more easily tuck it away into a planter or something. this 100ft hose came in a box about the size of half a two liter bottle, and it included a spray nozzle in the same box, that is really small, a standard 100ft hose is big and bulky to carry, and may even be too heavy for many people, this is light. So, buy it if you need a hose that can be stored in a small container, or a lightweight hose of reasonable length, don’t buy if the commercials gave you the same impression they gave me, that of a hose that more or less puts away itself. I turned mine off, but still attached to the house and went on to do other things. When I returned some hours later, it had burst and was shooting water into the air. So much for that. Oh how right you are. We have used these hoses and have seen them at customers homes quite a bit. I have yet to see one last. I love those expandable hoses. The only thing is they seem to leak after awhile especially the cheaper ones. I think what’s key about them is they don’t kink and they are so light weight! They sure don’t puthink away them selves though. True, it is light and doesn’t take much space. If it expands or not is not the problem. As we are seniors and most of our friends are also seniors, we all went for this type of hose. In no time something inside burst and it didn’t work anymore. It became useless as water was not going through. Please use this hose and comment in a few months if it is still o.k. I hope that those who have had same experience as our friends and us had or whose garden hose lasted a season or more will also comment. I used one of these hoses when they first came out. I really liked the ease of storage, however, the plastic connection did not hold up and I had leaks at the outside faucet. I believe the newer hoses now have brass fittings which is preferable and should prevent leaking. Well , I am so sorry for your bell peppers. My yield turned out to be good this time but last two times it was bad. I wish you good luck for the next time. Those hoses are convenient but they blow up quickly. Also they don’t flow nearly as well as a standard hose. I had tried a few of these over the last couple of years and all either split in the middle or at the fitting at one end or the other. This year I got one that had metal fittings and was in a heavier black jacket. I have used it all summer and it is still working just fine. I have 2 of these I bought at Menards last summer. I don’t think they are the “As Seen on TV” brand, they’re black, and I’ve found them useful. The first time out of the box, I almost popped it, and I realized that the key to keeping these working is to not turn the hose on full strength. I’ll usually turn the pressure on halfway, start walking to the pots I need to water, and I make sure the watering wand is set to “closed”. There is usually enough water built up to get a good soak, and to keep it flowing, esp. if I turn the wand “off” in between areas I need to water. They don’t compress as far down as they used to, but they are so much easier to manage as they are so lite. I’ve also tucked an empty flower pot near the faucet, and I just tuck the hose back in there when I’m finished each day.